Application: the name of the application that is using the connection (available on Windows XP SP2 and above). Protocol: the name of the protocol (TCP or UDP). Local Address: the IP address of the local computer and the port number being used. Remote Address: the IP address and port number of the remote computer to which the socket is connected. State: the state of a TCP connection. For more information about the states of a TCP connection, see RFC 793. Received/Sent: how much data was downloaded and uploaded by a connection. 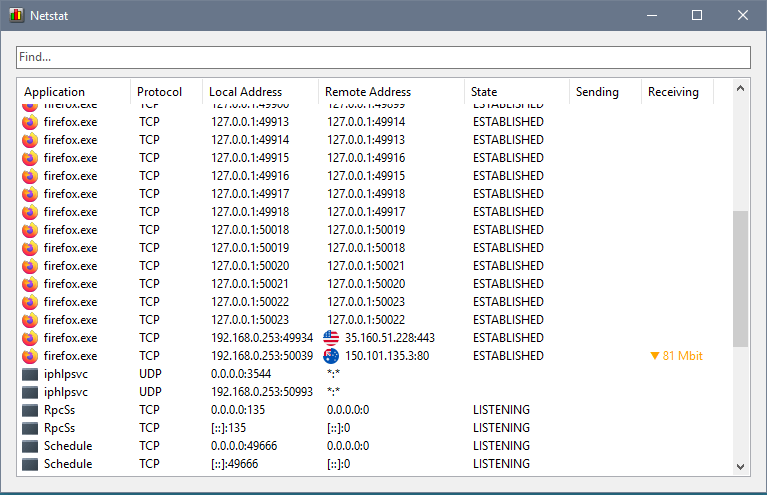 This feature requires the Ignore local traffic within the LAN option to be turned on.